The Le Pilotis overlooking the North Atlantic Ocean has been creating magic with its rich Mediterranean flavours with the extensive seafood, olive oil paella and grilled fish, to name a few. While soaking in the ocean breeze at the open-air terrace at the Le Pilotis, time seems to stop as you are lost in the vistas of the Casablanca coast. With the capacity of four hundred visitors, the restaurant has a conference room and the Nikkei Bar & Lounge with the Japanese and Peruvian influences. 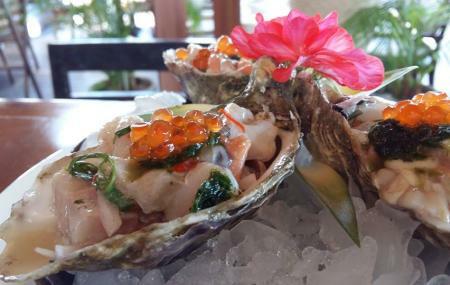 Starters like Squid Fries, Tomato and crab millefeuille, Provencal conchas and Crispy nems of spider meat, main courses like Grilled swordfish and Monkfish casserole with mushrooms and desserts like Pavlova, Tarte Tatin, Sorbet citron Yuzu and Fluffy hot chocolate are the special dishes. Four stars for the beautiful location on the ocean front. There are some negative comments from the customers disappointed by service. Moroccan employees are not service oriented. As long as they have a job, they don't care about customer service. Pilotis has a nice and charming little garden for kids but I have never seen any children playing in there, although I pass by a couple of times every week. The restaurant is expensive, of course. The food was excellent and the service was great. The view and ambiance were wonderful. The prices are a bit high, but worth it. A bit on the expensive side. The food tasted good, but my beef fillet was cooked way too long.